Support the Journey was born out of a desire to blend creative energy with fundraising on behalf of non-profit organizations. Although Support the Journey originally started in 2007 as Transflection Designs, the name was formally changed in 2010 to better reflect our values and mission. Support the Journey believes that when we bring our talents, skills and resources together, incredible things can happen. Exposure and success have occurred naturally over the years through the organic process of relationship building with other like-spirited people who are energized by the opportunity to give back and pay forward. 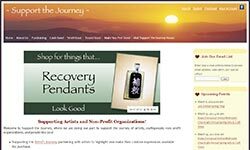 We hope you are personally inspired by and benefit from the work of Support the Journey. If you like what we’re doing or what we have to offer, please share it with others to help expand our reach and impact! “The path that leads you full circle” is what most have come to know as karma. The energy expressed has a ripple effect, transcending time and space, providing reflection as it touches others and returns to you along your journey. Support the Journey has partnered with the Mental Health Association in Pennsylvania (MHAPA) in developing the I’m the Evidence Mental Health Campaign (ITE/MH). ITE/MH is a grassroots campaign raising awareness about how each of us can positively impact the lives of people in mental health recovery. ITE/MH celebrates people who are the living evidence of mental health recovery, and individuals, organizations and communities that offer support and hope along the journey.